The urgency of ethics in design is now understood. In so many ways, design creates the world we depend on; (information) architecture creates the environments we live in. We’ve seen how technology is implicated in challenges to equality, human rights, dignity, justice, government, sustainability, and health. In IA, the concepts and language we choose are embedded in code, bringing our biases and assumptions with them. But what do I *do* about ethics at work? Do these issues apply? Where would I begin? How can I talk about it? What if I don’t have the power to change anything? What if the organization is stacked against it? And as a professional community, what should we be doing about ethics? How can we equip our members to address ethical issues in their work? This session combines a personal perspective with lessons learned from an online community for Ethical Technology founded two years ago at the 2017 IA Summit. We’ll look at design ethics through a systems thinking/theory lens. Design ethics means asking whether or not I’m doing the right thing as a designer. Systems thinking means recognizing that I’m working within a complex system where I don’t have full control over the consequences of my work—the ethical problems are too complex to analyze; my organization, as a whole, operates in ways that I can’t change. Ethical practice means uniting the personal with the global, knowing yourself while also recognizing your limitations. A systemic analysis of the ethical challenges designers face. Guiding principles for ethical practice in complex environments. Techniques for incorporating ethics into your work—whether by adding new methods, or by deepening the methods you already use. Recommendations on how our professional community can move forward with ethics as a core part of our field. Dan Zollman is an information architect and UX strategist living in Boston, MA. 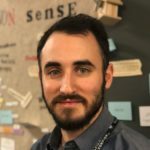 His interests in purposeful, ethical, and systemic design have evolved through his experiences practicing IA and UX in complex organizations including Vanguard and Tufts University. Dan is a co-organizer of World IA Day Boston, volunteer for the IA Institute and IA Roundtable, and organizer of the global Ethical Technology community (ethicsofdesign.org), which was founded here at the IA Conference in 2017.